Tempeh made total time 24 hours. This shows the fermenting part. The beans were prepared by boiling for ~30 minutes, running under cold water and removing the skins by hand rubbing and flushing,, steam pressure cooked for ~30 minutes, cooled to room temperature, tablespoon of vinegar added and mixed, starter powder 1/2 teaspoon added and mixed. Placed in molds and placed in the fermenter set at 31C for 24 hours. 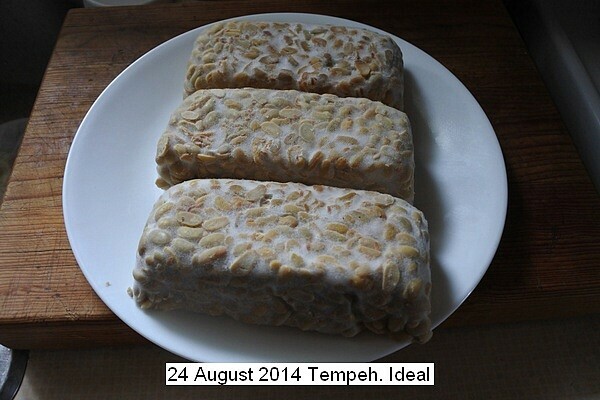 This entry was posted in Uncategorized and tagged 24 August 2014 Tempeh, Tempeh). Bookmark the permalink.